Fit: True to size - slightly tight in the toe box but I attribute that to having bunions from years of dance and sports :( . Fit is very similar to my Nine west grey suede flats that fit AMAZINGly after one wear. Likes: COLOR - I have nothing like this. The color in the pictures is true to what it looks like in person. The shoe also comes in several other colors including red and mustard yellow. If these shoes end up wearing well I will definitely be purchasing a few other colors to broaden my flats collection. Dislikes: the heel already looks a little worn, like the fabric was stretched too thin. I should have taken a picture. I think there were reviews about this online. But honestly, the entire rest of the shoe looks great and its only at the seam at the back. I'm probably wearing them tomorrow for a Color Brigade post so I will take pictures of the heel then. Verdict: Keeping. Will see how they wear and hopefully will be purchasing at least 2 other colors soon. Likes: I like the simple style and the color is a nice brown with red undertones, I guess why the color is called "burgundy." Dislikes: the pleather looks kind of plastic-y but its not supposed to be patent. Verdict: still unsure. The reason I put two different shoes on is that the right shoe (Nine west) is the shoe I am thinking of throwing out. What do you guys think about the difference in style? 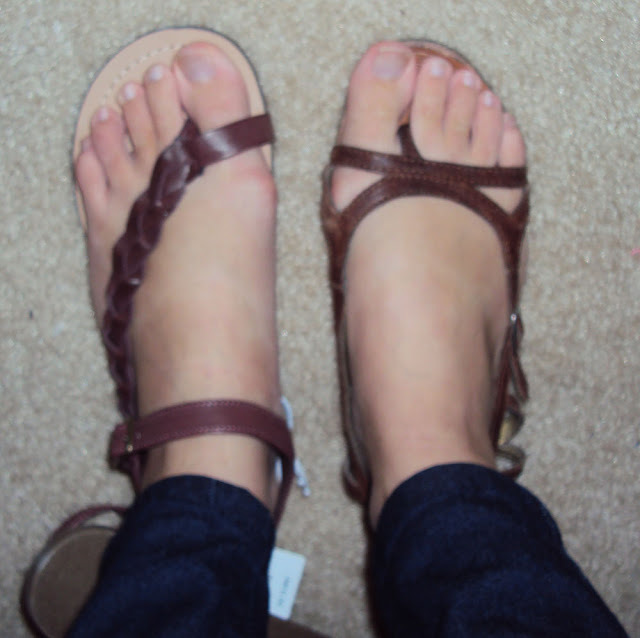 Both are simple brown sandals. The right ones are getting kind of old, but I can easily keep wearing them and decide not to throw them out. Do you like the left or right shoe better?? Fit: VERY tight in the toe box, making my feet feel like sausages. Heel gap in the back (see right picture). Pretty weird overall. I feel like the toe box would stretch out if I wore them but do I have the patience to wait for that to happen? Likes: I ordered these because the Versie patent pumps were sold out in my size at the time. I did like that they were NOT patent because I really am not a huge fan of patent leather in the first place. I like the color in person. Dislikes: I dont like that the heel is not the same color as the shoe. I don't like that the color of the shoe really does not match my skin tone. The fit isnt great. Verdict: I will wait for the other Versie patent pumps to arrive before making my decision. It might be that they will both be going back if the fit is the same on the other ones. However, the Versie has such great reviews online that I feel like the fit out of the box shouldnt be what I judge the shoe for.